Ideal where down time is a critical factor. Acrylic resin floor systems (MMA) are ready for use an hour after application. In addition, its very low cure temperature (-20F) allows install ti on in freezers and cool rooms with minimal effect to production. It is UV resistant and can be used indoors or outdoors without chalking or yellowing. 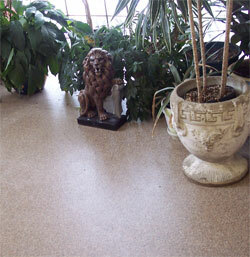 A seamless, self-leveling system, Acrylic floors can be used over concrete, wood or tiled surface. Epoxy provides a very durable, fade resistant finish with very good abrasion resistance and resistance to acidic materials, alkalis and other industrial chemicals. Because of its seamless characteristics and very low porosity it is very easy to clean and maintain. Epoxy floor systems are available in a variety of colors, surface finish and optional additives such as non-skid or antimicrobial to address specific needs. 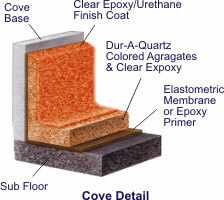 To extend the life and performance of an Epoxy floor system, we highly recommend applying a top seal coat. Urethane floor coating systems provide a very durable, easily colored, high gloss light reflective surface in demanding commercial and industrial settings. They are mostly used as a final top coat and available in high gloss or matt finish. Accidental discharge of static electricity can damage sensitive electronic equipment and components. This is especially critical where IC’s, memory or BIOS chips are manufactured or used in other assemblies. An electrostatic dissipative flooring system will eliminate unwanted static build up by dissipating static electricity caused by motion friction. Hospitals, restaurants, bio labs and food processing plants need a germ free environment. Not only is a seamless, epoxy coated floor much cleaner, an Antimicrobial top coats applied to the epoxy base can help prevent the spread of micro organisms. 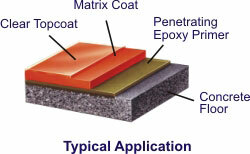 Methyl Methacrylate (Acrylic) floors cure in one hour and can be applied at -20 degrees. Antimicrobial floors help prevent the spread of microorganisms. Applications include hospitals, laboratories, clean rooms and pharmaceutical production. MARTENS will install a floor that will enhance the architectural features of your facility. MARTENS can embed your company logo, team logo or any graphic on your shop, garage or lobby floors...more>.